Behind the scenes: It’s 1992 and Jeffrey is photographing on assignment for Newsweek in Bali, Indonesia. The king’s wife has died, and an auspicious day has finally arrived for her funeral ceremony. For Hindus, the days between death and ceremony are spent in intense preparation as they organize the myriad details involved in rituals leading up to the cremation. It’s believed the soul of the dead can only leave the body once the body’s five elements of air, earth, fire, water and space have been returned to the cosmos. Once this happens then the soul can depart and find its new life through reincarnation. Mishandling of any small detail can prevent the soul from reincarnating. 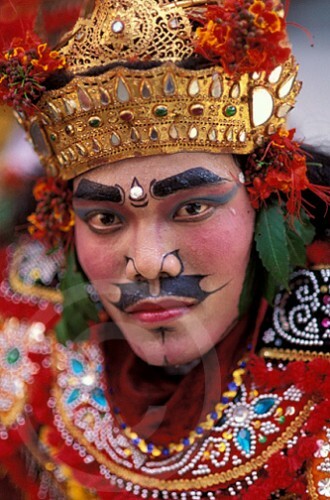 The Balinese have spared no detail in this elaborate three-day event, which is taking place in Ubud, the cultural center of Bali. Jeffrey has been working in Asia non-stop for over a month, and can feel the weight of the pace he’s been keeping—photographing everything from a story on rice in Japan to a feature on the Yangtze River in China to yet another on Beijing’s lively outdoor markets—but he’s also energized by this visually compelling and culturally important event. As Jeffrey stands photographing next to his friend, Robin Moyer, who is working on assignment for Time Magazine, the two men can’t help but laugh at themselves. Every person in attendance is required to wear traditional dress during this formal ceremony. Photographers are no exception. 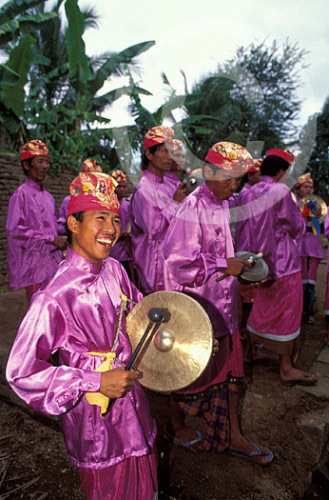 Not only are both men sporting batik sarongs over their Levis but also Indonesian udengs (wraps) on their heads. While Indonesian men look handsome, the two of them look absurd. It is over 100 degrees with humidity equally as brutal, but Jeffrey pays little attention to the heat. Everywhere he looks he sees a blaze of color. High priestesses carry out blessings and holy water ceremonies, musicians and dancers perform traditional movements, women adorned in vibrant dresses carry offerings atop their heads, and others lead a procession which eventually arrives at the funeral pyre. When the elaborate pyre is finally lit, it quickly catches on fire and bursts into hot flames. It is this moment the Rajah’s wife’s soul is released into the cosmos to seek its karma and reincarnation. 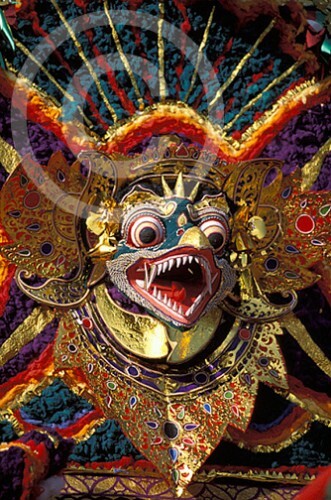 What Jeffrey witnesses is an awe-inspiring celebration of Balinese culture. Gratitude brews beneath his sweat-drenched udeng as he knows once again that his camera has opened a door to a place and time that he otherwise never would have experienced. This image was created with a Nikon F4 camera, Nikon 80-200mm lens, and Fuji Velvia film. To view a few more images from this ceremony in Bali, click here or on the photo of the musicians to the left. What cultural ceremony or event has stirred your soul? I’d love to hear your most memorable moments! 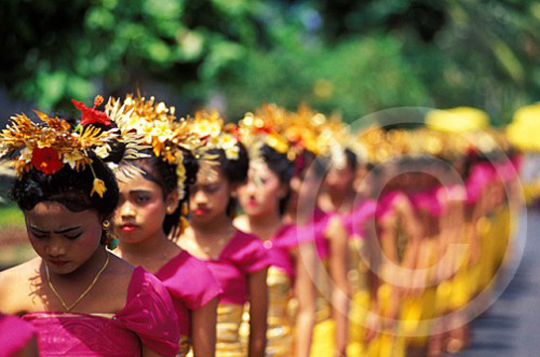 This entry was posted in Photography, Travel and tagged asia, bali, ceremonies, cultures, hindu, inodonesia, jeffrey aaronson, photography, photojournalism, photos by Becky Green Aaronson. Bookmark the permalink. As always, I travel to another country before breakfast with Jeffrey’s photos and your stories. I’d love to have seen your husband in his makeshift funeralwear. As for the dark depressing funeral services other people commented on, I don’t think I’ve ever worn black to a funeral. In my family, we eat and laugh and tell wonderful stories that celebrate a life and don’t mourn it. One day I’ll revise my essay about confounding the funeral home director because my sisters and I couldn’t stop laughing while planning my dad’s service. Julie, I tried to dig up a photograph of Jeffrey and Robin Moyer wearing sarongs, but alas, it ended up in storage. I like your family’s funeral celebrations, and I had a huge smile on my face when you described you and your sister getting the giggles at the funeral home. You are my kind of people! LOVE this post! This was absolutely inspiring. The photographs are gorgeous. Thanks, Christine. I’m glad you enjoyed it. I appreciate you taking the time to leave me a comment! Just the other night, I heard two photographers (Abe Frajndlich and Duane Michals) talk about what it is that makes a photograph become an expression of more than the image (i.e., the captured moment) itself. Jeffrey does such a wonderful job of bringing to life the implicit story suffused in each photo. And the back-story you add brings yet another dimension to these extraordinary Thursday picture(s) of the week. Deborah, what a treat to hear those two icons talk about photography! I wish I could have been there too. Thank you for your generous words once again. Your comments never cease to make me feel rich with gratitude. Becky, I love how you open our eyes to other cultures. I’m impressed, too, with all the research, discussion with Jeffrey, that goes into each one of these stories. What impresses me about this story is that it is about a funeral and yet the colors they are wearing are so brilliant, so unlike us wearing black. Perhaps instead of wearing black, we, too, should be wearing bright colors, to celebrate a life. Anyway, I imagine your house must be very colorful with these photos displayed everywhere. Which is what I love about Jeffrey’s photos. There’s so much color. Brilliant color. Monica, I feel fortunate that we can share these cultures with you. It’s one of the inspirations for starting this blog. I’m glad you appreciate color too! I have to laugh at your comment thinking we must have a lot of Jeffrey’s photos displayed everywhere in our house. You’d think, but he’s never been one to showcase his own work at home, so we only have a couple small images hanging on our walls. Kind of ironic, huh? So wonderful to travel to these amazing moments in these amazing cultures with you and your photos and words! Thank you Cathy, and I’m enjoying reading your fiction! I can’t wait to find out what Mrs. Li does next! Beautiful images, Becky–by camera and by your words. We’re so closed up and tight-lipped about death here in the U.S. Everyone wears black and our mourning is so quiet and introspective. I imagine that’s why our grieving process takes so long to work through–we keep our pain on the inside. It’s uplifting for me to see how other cultures create such colorful and intense tributes when someone dies. I know that when I go, I’d love a big colorful party with dancing and costumes! I’m with you on that; I hope my peeps have a big crazy party when I go, complete with the Beatles and Stones blasting, lots of red wine and dancing. No black allowed. Only bright colors and hopefully lots of laughter pulled from great memories. To me, death is about appreciating life, so why not make it a celebration? In our society it’s a long process which continues for next 13 days. Arindam, I was thinking about you when I wrote this piece, wondering if Hindu funeral ceremonies in India are similar. Thanks for sharing your traditions with us. To answer your question about how Jeffrey remembers so much. First, he has an amazing memory–better than almost anybody I know. Second, I sit down and interview him and ask him questions about each event or assignment. This helps bring back memories from that moment in time. Third, I go through and research everything in our documents, his passport, his photographs, then I follow up with more historical research to make sure everything is accurate. It’s a time-consuming process, but it is a labor of love. As far as a guest post, I have asked Jeffrey (and also mentioned your special request), so hopefully he will do that soon. He is in the middle of a new art project which is taking all of his time, but hopefully he will be able to find the time. What would you like to know from him? First of all Becky, i just want to congrats you. Because there are very few women in this planet, who want to know in detail about the work their men are doing; rather then complaining about those things which those men can’t do in personal life.due to their professional commitments. As always you are a source for inspiration for everyone. You people not only respect each other, but also respect each other’s passions, which is really a big thing. 1. How he remain focused to his job rather than the other things that comes with success, after seeing all those success in his early life as a photographer? 2. What challenges (both professional and personal) a person needs to be prepared for, if he is a creative person? 3. Till life gave him the biggest chance to prove a point that was to visit china, how he helped his passion and ambition to stay alive in him. Arindam, I will pass along your questions to Jeffrey so when he does his guest post, he’ll be sure to answer them. And thank you for your kind words once again! Beautiful writing, beautiful photos… just wow! I am living vicariously through your husband’s work and your blog. I used to have a dream at one point in my life to become a photographer for Time or National Geographic and the like. My parents always had them around and I was spellbound by some of the photos and how they could tell a story, evoke emotion, etc. It’s amazing to read a story of what taking those photos would be like. Now my daughter thinks she wants to go into photojournalism. She is 13, so I’m not sure I could get her to read your blog, but I will try. Thanks for the inspiring post. It does give me drive to do more, see more, and “be” more.